Manatees are the roly-poly “teddy bears” of the sea. They are also known as sea cows, but despite this nickname, they are more closely related to elephants. These large, gray aquatic herbivores have rotund bodies that taper to a flat, paddle-shaped tail, which propels them through the water. Part of the manatees’ charm is the wrinkled face with whiskers on its broad snout. There are three known species of this marine mammal, each named for the area where they they live: the West Indian manatee ranges along the east coast of North America from Florida to Brazil; Amazon manatees inhabit the Amazon River; and the African variety survives along rivers and the west coast of Africa. The bones in manatee flippers are similar to a human hand, with jointed finger bones. Built for speed. Overall, manatees appear slow moving and cumbersome, but they are graceful and can be swift underwater. Manatees usually travel at about 5 miles per hour (8 kilometers per hour), but in a pinch they can pick up the pace to 15 miles per hour (24 kilometers per hour). They often linger near the surface of the water, where they can suffer collisions with speedboats and other vessels. The manatee skeleton is made of very dense bone (pachyostotic) a condition that may contribute to its “neutral buoyancy,” meaning its physical body density is equal to the water in which it swims. Interestingly, the manatee’s rib bones are solid, lacking red blood cell-making marrow—its sternum (breastbone) is where marrow is found. Speaking of bones, manatees have only six neck vertebrae, while most other mammals (including humans and giraffes) have seven (the tree sloth is the only other exception). So manatees cannot turn their head—they must turn their whole body to see what’s going on behind or to the side of them. Manatees have two good-sized front flippers, each with three to four “fingernails,” except the Amazon manatee, which has no nails (its Latin species name “inunguis” means “without nails”). The bones in the flippers are similar to a human hand, with jointed finger bones. Manatees seek out the warm waters of Florida, the Amazon, and Africa, depending upon the species. I see you. While a manatee’s eyes may appear small, their vision is acute. They are able to distinguish different sized objects, colors, and patterns. They even have a special nictitating membrane that protects the eyeball from hazards. They do not have eyelashes, but instead the eye muscles close in a circular motion, like an aperture on a camera. They do not have outer ear structures, but they likely have excellent hearing, due to the large inner ear bones. Pssst! While sensory systems of manatees have not been well studied, their large inner ear bones may indicate their underwater communication. According to Save the Manatee, the animals emit chirps, whistles, and squeaks to reach out to others. These sounds may express fear, anger, or sexual arousal and are also a way to stay in contact with others in murky waters. Manatees also use their flippers to touch and soothe each other. Tracking manatees. Scientists want to learn all they can about manatees. Research staff with the Florida Fish and Wildlife Conservation Commission have tracked manatees for over 20 years to better understand the resources required to recover and sustain a healthy population. The animal’s rounded body shape and rough skin was a challenge to get a tracking unit attached to. Eventually, they discovered that the best place to attach a GPS transmitter was to its peduncle, the padded “belt” at the base of the manatee’s tail, which is slightly narrower than the rest of its body. The buoyant radio tag transmits a detailed record of manatee movements and migratory behavior, which can help guide effective conservation strategies. Habitat. Manatees inhabit coastal waters, slow-moving rivers, estuaries, lagoons and saltwater bays. They will migrate to warm waters in the winter. West African and West Indian manatees need water that is at least 60 degrees Fahrenheit (15.6 degrees Celsius). While they may look padded and protected, they have a low metabolic rate and minimal fat layer. Also, these two species live on the cusp of salt water and fresh water. They have an internal regulation system that works with the kidneys to keep salt concentrations at manageable levels. The Amazon manatee is restricted to fresh water. Manatees in Florida congregate at power plant discharge pipes where the water is warm, according to National Geographic. Many manatees migrate to Florida to wait out the winter from November to March. Country code. Manatees stay in rivers, seas, and oceans along the coast of several countries. For instance, the African manatee lives along rivers and coasts of western Africa; the Amazon manatee lives in the Amazon River’s drainage, from the headwaters in Colombia, Peru, and Ecuador to the mouth of the Amazon in Brazil; the West Indian or American manatee persists in the southern and eastern US. A pair of manatees graze in the warm, shallow waters of Florida. These marine mammals eat primarily underwater grasses, consuming up to 150 pounds of green matter in a day. Just browsing. Manatees make a living eating underwater grasses. They can munch 100 to 150 pounds of greens a day! In fact, the West Indian manatee was such a good grazer, it was introduced to the Panama Canal in the 1960s to aid in weed control. That population increased and extended its range to the Pacific Ocean. In addition to grasses, manatees also eat algae and can consume a tenth of their body weight in plant matter within 24 hours. The manatee’s teeth are called “marching molars” because they are replaced throughout the animal’s lifetime as they wear down from the abrasive diet. New molars form at the rear of the jaw and slowly move forward, replacing the older, worn teeth in front. Manatees can remain underwater for up to 20 minutes, but like all mammals, they need to breathe air. Wet welcome. Manatees are at home in the water—they never come onto land. They swim along, poking their nose above the water to catch a breath every few minutes. Should they decide to nap, they can stay underwater for 20 minutes without taking a breath! When they do take a breath, they do it well: 90 percent of the air in their lungs is replaced, while humans, in contrast, only replace about 10 percent. They tend to “cruise” near the surface of the water, which puts them at risk of colliding with propellers of watercraft. What'cha doin'? As a large-bodied herbivore, the manatee must feed for almost half the day. These mammals often swim alone or in pairs—with no territory or mate to defend, and plant matter mostly plentiful, they do not need a leader. If a group of these animals is spotted, it could be a mating herd made up of optimistic males or a casual meeting of individuals “sharing a warm area that has a large food supply,” explains Live Science. A group of manatees is called an aggregation. Look out! Crocodiles, alligators, and sharks may take young or weak manatees—their potential predators depend on where they live. But as healthy adults, this large, lumbering animal has no natural predators in the wild, although human activities including boating, hunting, and pollution have impacted all three species of manatee. For instance, about half the deaths of West Indian manatees are due to boat collisions. Being highly buoyant and slow swimming in warm waters makes them vulnerable to human activities. They also get caught in fishing nets in the Amazon and West Africa. They are hunted for their meat in West Africa. Red tide. In 2013, deaths of Florida manatees (West Indian) reached a record high with 829 animals perishing, including 126 calves. It was more than double the deaths from the previous year and represented a 17 percent loss of the population. It was largely due to an uptick in toxic red tide events, which are exacerbated by “nutrient loading” pollution (agricultural runoff and human waste) and rising water temperatures. While toxins in red tide algae are always present in the Gulf of Mexico, when there’s a bloom, fatal amounts of the algae containing a nerve poison called brevetoxin may be attached to the food manatees eat and floating in the air they breathe, causing paralysis, which can lead to suffocation. A "mom-atee" with her calf, which will nurse for about 18 months. Manatees can live up to 60 years. Giving calves a leg up. A female manatee may be “courted” by a dozen males (called bulls) in a mating herd. Once he has mated, he takes no part in raising the calf, which is born underwater about 12 months later. The mother helps the little one rise to the surface for air after birth; it will be able to swim on its own after about an hour. The calves nurse for about 18 months while mom feasts on water grasses, weeds, and algae. The youngster will become mature at about five years old; they can live 40 to 60 years. There are no manatees currently in the collection. A sign posted to warn boats to look out for manatees, as they often swim near the surface and may come into contact with boats. Status. The International Union for Conservation of Nature (IUCN) Red List of Threatened Species lists all three manatee species as Vulnerable and decreasing in numbers. Manatees were among the first creatures listed on the Endangered Species Preservation Act of 1966, joining the American alligator, red wolf, grizzly bear, and whooping crane. In the spring of 2017, after much conservation effort, the U.S. Fish and Wildlife Service declared the West Indian manatees in Florida "threatened," which means they are still protected under the Endangered Species Act, but not considered "endangered." Now numbering about 6,620, the manatee has rebounded from just a few hundred individuals in the 1970s. It is significant progress, but the sea cow is still vulnerable to a number of threats, including climate change, pollution, and human activities. Fortunately, "It will also continue to be protected under the Marine Mammal Protection Act," added the U.S. Fish and Wildlife Service. Clean and healthy oceans and waterways are necessary for the manatee to thrive. 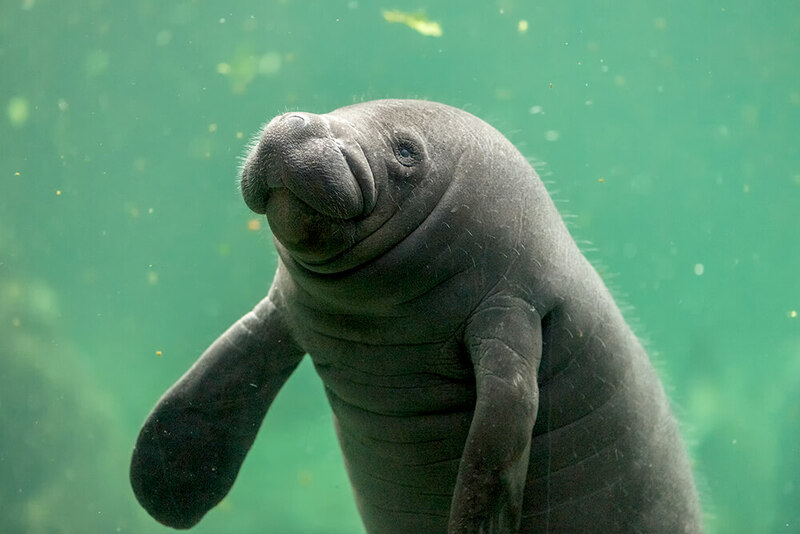 The Florida Manatee Recovery Plan includes conducting research to monitor habitat use patterns, developing site-specific boat speed zones to protect the animals, rescuing and rehabilitating distressed manatees, education and public awareness, protecting warm water refuges, and enforcing regulations to protect these marine mammals. You can help us bring species back from the brink by supporting the San Diego Zoo Global Wildlife Conservancy. Together, we can save and protect wildlife around the globe. The closest living relatives to the manatee are the elephant and the hyrax. They diverged from a common land mammal over 50 million years ago. Like elephants, a manatee’s molars wear down and move forward and fall out, and are replaced by new teeth coming in at the back of the mouth. Manatee brains are smooth (other animals, including humans have cortical folds) and its ratio of brain size to body size is the lowest of any mammal. While most mammals—from giraffes to cats—have seven neck vertebrae, only tree sloths and manatees defy that rule. A manatee has only six vertebrae in its neck. Manatees spend most of their time near the surface of the water, as they need to breathe air. There are three species of manatee named for the area where they live: the West Indian ranges along the east coast from Florida to Brazil; the Amazon manatee inhabit the Amazon River; and the African variety survives along rivers and the west coast of Africa. The Order Sirenia consists of the three manatee species and another rare marine mammal called the dugong. The Greek name for the Order Sirenia is derived from the sirens of Greek mythology, which were sea nymphs who lured sailors to their island with their mesmerizing songs. The West Indian manatee has two subspecies: Antillean and Florida manatees.